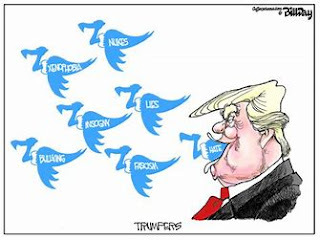 Between 9:04 am and 9:37 am, Trump sent 5 tweets -- all around the same basic theme: He is being unfairly persecuted by special counsel Robert Mueller even as Mueller and the broader FBI overlook crimes by Democrats. The tweets are riddled with misinformation and, in some cases, outright falsehoods. Taken together, Trump said 11 things that aren't true. Here's the breakdown -- tweet by tweet. There's zero factual basis -- at least that I can find -- for Trump putting a $20 million price tag on the Mueller probe. The closest we have come to a fact-based cost for the Mueller probe is back in December, when the investigation's total cost was $6.7 million. Trump's claim that there are 13 Democrats on Mueller's team is also false. According to The Washington Post's Fact Checker, five of the 16 known members of Mueller's team donated to Hillary Clinton's 2016 campaign. The New York Times says that nine of the 17 known lawyers on Mueller's team have donated to Democratic campaigns in the past. Then there's this from the Post's Philip Bump: "Of the 18 attorneys we identified on Mueller's team, half gave no money to anyone, according to our analysis. Another five gave $1,000 or less. The one who gave the most also gave to two Republicans." It's not entirely clear who Trump is referring to with the line "two people who have worked for Obama for 8 years" but, presumably, one of them is Mueller himself. The problem with that is that Mueller was appointed FBI director by President George W. Bush, a Republican. President Obama simply kept Mueller on for the length of his 10-year term. Trump says that Mueller's team has found no collusion (he misspelled that word in the original tweet), but that too is not accurate. The investigation is ongoing and all of Mueller's findings have yet to go public. The $145 million figure Trump is referring to is the total donations to the Clinton Foundation by nine individuals who also at one time or another had investments in a Russian company that Clinton's State Department allowed to buy a majority stake in Uranium One, a Canada-based company with US mining interests. The problems with Trump's claim, as detailed here by PolitiFact, are considerable and include the fact that the donations to the Clinton Foundation were made prior to the idea of Clinton serving as secretary of State and that State was one of nine agencies who okayed the deal. Trump's insistence that someone in the Clinton campaign paid then-FBI Deputy Director Andrew McCabe's wife $700,000 as a payoff to drop any investigations into them is a jumble of falsehoods. McCabe's wife ran for the state Senate in Virginia in 2015. A super PAC affiliated with Virginia Gov. Terry McAuliffe, a longtime Clinton ally, donated $500,000 to her campaign. She lost. There is zero evidence that Hillary Clinton was involved in the donation in any way, shape or form, or that McAuliffe made the donation to dissuade Andrew McCabe from looking into alleged wrongdoing by the Clintons. The Mueller probe has not "given up" on Russia. It's worth noting that five people in the Trump campaign orbit have already pleaded guilty to crimes unearthed by Mueller and several -- including former national security adviser Michael Flynn and former deputy campaign chairman Rick Gates -- are cooperating with the Mueller probe. It's less clear what Trump is referring to with the phrase "Dems FISA abuse" although he has repeatedly suggested that Obama ordered a wiretap on him at Trump Tower during the campaign (not true) and that the FBI placed an informant in his campaign as spy (knowledgeable sources deny that claim).